Hurricane Sandy affected many lives over the past week, and we send our prayers and thoughts out to those who are struggling and may have suffered loss. One effect of this storm in several areas of the country has been snow, and lots of it! Gatlinburg and the Great Smoky Mountains are included in this early snow! Below you will find some beautiful photos and links to more information. Enjoy! Last year, I cross-country skied on Clingman’s Dome Road. This 7-mile road leads up to the highest point in the Smokies, Clingman’s Dome, at 6,643 feet. This road is a popular tourist destination in the warmer months, but in the winter it is closed to all motorized vehicles(until April 1). This high elevation road probably gets more snow than anywhere else in the Park! And since it is closed in the winter, it never gets plowed, creating great conditions for great cross-country skiing and snowshoeing! Those that are feeling ambitious go the whole distance to Clingman’s Dome – 14 miles roundtrip! When they arrive at the Clingman’s Dome Observation Tower, they may have the whole place to themselves – a rare occurrence at this popular spot! I wasn’t feeling quite that ambitious, so we skied 2 miles in and 2 miles out. It is amazing how much it snowed last winter here in the Smokies! It made for some treacherous driving, but was also great for winter sports! Up on Clingman’s Dome Road there were between 10 inches and 2 feet of snow (depending on how sunny or shady the spot)! 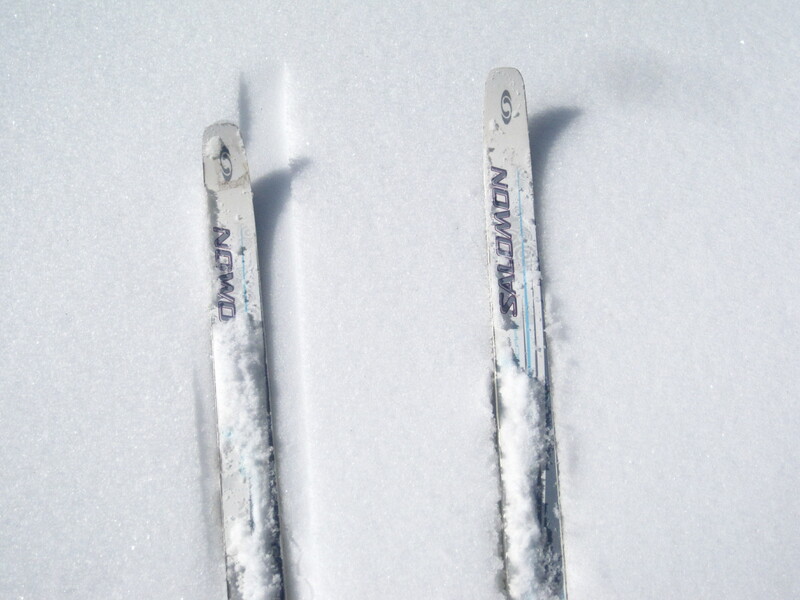 What started out as near perfect powder, became somewhat sticky beneath our skis as the day warmed up. After an hour or so, we took a break and I decided to build a snowman! Over the next half hour I had a blast building my creation which ended up being a snowbear! At first I was sad to leave him, but I’m glad that I don’t have to watch him melt! Hopefully he will make a few people smile as they pass by in the next few days! Unfortunately I don’t know of ANY places around here that rent cross-country skis or snowshoes. Usually we don’t get that much snow, so renting out these items probably hasn’t been profitable in the past. If you are coming to visit Gatlinburg from far away, my advice is to find some cross-country skis or snowshoes before you leave and bring them with you! You can always find them online too. Try Craigslist for a used pair – I actually found a few used pairs in the Knoxville area! If you decide to try out Clingman’s Dome Road this winter, I hope you have fun! I parked right by the closed gate, off to the side so that other cars can get by. The Park Service might prefer that you park in the Newfound Gap parking lot, but then you would need to walk on the sometimes busy road, so I am not sure which is best. Use your best judgement! Make sure you bring everything you normally would for hiking: water, hat, gloves, sunglasses, snacks. Keep in mind that you will warm up fast since this is GREAT cardio! This is where layering is important. I only wore my jacket for about 5 minutes! Then it stayed in my backpack for the rest of the day. No Lifts – I don’t get cold sitting on the lift. I can bring my dog and it’s great exercise for him too! I can do it in my backyard, and a bunch of other places! I can watch winter wildlife and look for tracks. It gets me outside and into the sun, which helps beat winter blues. *Nothing against snowboarding. I still love snowboarding! Since they can’t control the weather, cabin rental companies don’t give refunds due to weather or road conditions. Besides, you’re coming to the mountains to enjoy the mountains! If you have a 4-wheel drive vehicle, or can borrow one from a friend or rent one, we recommend this. If not, invest in chains for your tires. Our Wal-Mart here sells them for just $25-$65, depending on tire size. Well worth the investment! If you would still rather just avoid the steep hills altogether, make sure to ask your reservationist for a cabin that has no steep hills to get to. This can be very difficult to find around here, so be sure to book early. The Holidays are coming! In fact, if you come to Gatlinburg, you’ll think they’re already here! The calls come in daily… “What are some good Christmas shows to go to?”, “When can I see the lights?”, “Tell me about the Christmas parade!”. If you think summer is the only time when Gatlinburg is throbbing with excitement, you should try coming here for the holidays!! There are enough shows to make your head spin! Most of the theatres and dinner theatres around here have a special Christmas or Holiday show, including: Dixie Stampede, Smoky Mtn Opry, Smith Family Theater, Country Tonight, Tennessee Shindig, Sweet Fanny Adams Theater, and the Comedy Barn! First Baptist Sevierville will put on a magnificent Singing Christmas Tree on Dec 4 & 5 at 6:30pm, both evenings. You can call the church office at (865) 453-9001 with any questions! The Great Smoky Mountain Dance Theatre will present The Nutcracker “Sweet” at the W.L. Mills Auditorium on November 25 & 26 at 7:00 pm both evenings. Call (865) 680-7369 for information and reservations. Throughout the streets of downtown Gatlinburg, each Friday and Saturday evening between Thanksgiving and Christmas, view the Winter Magic version of Gatlinburg’s Tunes and Tales, with live music to enjoy as you’re exploring our downtown Parkway! If ice skating tickles your fancy, enjoy Christmas on Ice, presented at Ober Gatlinburg’s ice-skating rink, or go ice skating for yourself! Dollywood is also doing a Christmas on Ice show! If you like to look at Christmas lights, don’t miss the Smokies! Gatlinburg is gleaming with millions of LED lights, transforming the town into a gorgeous winter wonderland! For a preview of this year’s light display, watch this video! Pigeon Forge is also covered in LED lights! You can even take a Trolley Tour of Lights! And don’t forget Sevierville, your hometown in the Smokies! You can even view their LED light display in 3D with special 3D glasses available while supplies last! What better place to do your Christmas shopping than Gatlinburg and the Smoky Mountain Area! From charming local shops to the bargains of the outlet malls to an array of Christmas stores, the Smokies has everything you need to have an enjoyable Holiday shopping experience! Perhaps some of you come here in the winter specifically to find the snow! I don’t think you will be disappointed! Although the snow rarely sticks around for long down in town, you can easily drive or hike up into the higher elevations to find some snow to play in, if it doesn’t snow in town while you’re here! You can even rent a cabin up in the higher elevations, if you’d like to really surround yourself with snow! Everyone wants to know about the Christmas Parade! The Gatlinburg Fantasy of Lights Christmas Parade starts at light #1A on Hwy 321, and ends at light #10 on Parkway! It will be on December 2, beginning at 7:30 pm. Over the course of about an hour and a half, a stunning array of parade entries, marching bands, giant helium balloons, and even the Oscar Mayer Wienermobile, as more than 80,000 people line the streets! Don’t miss the excitement! Yesterday, I cross-country skied on Clingman’s Dome Road. This 7-mile road leads up to the highest point in the Smokies, Clingman’s Dome, at 6,643 feet. This road is a popular tourist destination in the warmer months, but in the winter it is closed to all motorized vehicles(until April 1). This high elevation road probably gets more snow than anywhere else in the Park! And since it is closed in the winter, it never gets plowed, creating great conditions for great cross-country skiing and snowshoeing! It is amazing how much it has snowed so far this winter here in the Smokies! It’s made for some treacherous driving, but has also been great for winter sports! Up on Clingman’s Dome Road there were between 10 inches and 2 feet of snow (depending on how sunny or shady the spot)! What started out as near perfect powder, became somewhat sticky beneath our skis as the day warmed up. Unfortunately I don’t know of ANY places around here that rent cross-country skis or snowshoes. Usually we don’t get this much snow, so renting out these items probably hasn’t been profitable in the past. If you are coming to visit Gatlinburg from far away, my advice is to find some cross-country skis or snowshoes before you leave and bring them with you! You can always find them online too. Try Craigslist for a used pair – I actually found a few used pairs in the Knoxville area! 5. Snow Snow Snow! What happens if you were hoping for snow and don’t see any when you get here? Well, you have to find the snow. Snowfalls of an inch or more occur on average only one to five times per year in the valleys of the Great Smoky Mountains although Gatlinburg has already had two of these snowfalls in December alone. In the high country, over five feet of snow falls most years. If the Newfound Gap Road has not been closed because of snow, a trip to Newfound Gap is your best bet for finding snow. Have fun and dress warm! Whether you are looking for a great steak like those at the Alamo Steakhouse, a gourmet breakfast from the Pancake Pantry, or a indulgent lunch from the Haufbrau House, there is a little something for everyone. By the way, if you love Italian food, Gatlinburg does it well over and over. Check out our Best Italian Food post! A simply ceremony at a cabin like Bear’s Den can help create a beautiful memory and a place to return for many years to come. It’s the best cure for cabin fever! If you decide to venture into the woods this time of year, make sure you are prepared! Here are some important things to bring and keep in mind! Wool or Synthetic Clothing – (socks especially) Ever heard the expression “Cotton Kills”? When cotton gets wet, it gets cold! Wool (and many synthetics) on the other hand retain heat even when wet. Wool socks are the best for winter hiking, because odds are, if there is snow on the ground, your feet WILL get wet! Appropriate Footwear – Please don’t go hiking in your summer running shoes! Heavy duty winter hiking boots with sturdy soles are ideal. Waterproof GORE-TEX boots are best, but you can probably get by with a warm pair of snow boots too. YakTrax – YakTrax are similar to crampons which help you get a better grip on ice and packed snow. Unlike crampons, which make me think of hard-core mountain climbing, YakTrax are more for everyday use, including walking on icy steps and driveways. If you think the trail might be icy, it would be great to have a pair of these in your pack, just in case! Water and Snacks – These are important all year round. You will stay a lot warmer if you are hydrated and have a healthy blood sugar level. Make sure you bring more water and snacks for longer hikes. Trail Map – Again, something I ALWAYS have, no matter what time of year. Trekking Poles – These are very helpful on icy trails! Emergency Supplies – These may not be necessary for a 1/2 mile walk, but definitely bring these on longer hikes. Compass – Don’t rely on only a GPS. Winter daylight hours are shorter, so plan to hike earlier in the day and don’t get stuck in the dark! Check the weather forecast before you go out. All these tips are intended for short day-hikes. If you are thinking of doing something longer or a winter-camping trip, please do more research! Backpacking is a lot of fun, but it requires much more preparation and a permit from the Park.